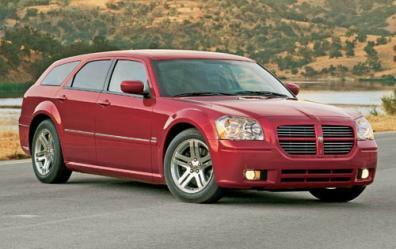 Dodge Magnum RT is a powerful muscle sports wagon. The new Magnum is a great looking car that will get your neighbors talking as you rumble around the block. The unique styling of the Magnum will also attract muscle car group in the form of 18-22 year old guys pointing for their friends to �check that out�. And a few people will approach you as you are filling up the gas tank to ask, �Does it really have a Hemi?�, with only a vague notion that it somehow makes the car better. The Magnum is offered with many different engine sizes (either a 6-cylinder or 8-cylinder) with your choice of horsepower output of 190, 250, 340 and 425. The price of the vehicle also corresponds with the engine size starting at $30,345 to the expensive STR-8 model for $37,320. A big part of the mystique around this car is the Hemi engine. The Hemi is short for hemispherical combustion chamber, which creates more efficient fuel burning and allows larger valves for better airflow. Basically, it produces more power than an engine with its displacement would normally produce. 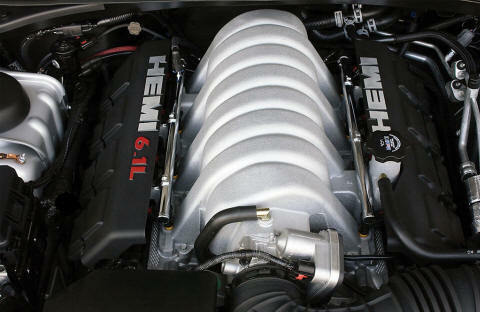 (There are also drawbacks to the Hemi, which is why it isn�t the only engine that Chrysler produces). The interior of the car looks much more expensive than you�d expect for the price of the Magnum. 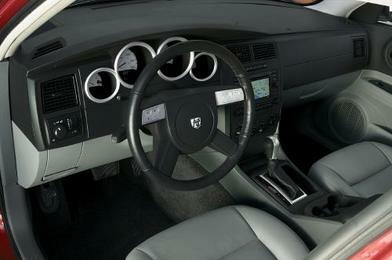 Since Mercedes bought Chrysler, the Dodge vehicles I�ve sampled have had a sharp improvement in interior quality. While on the road, the car is very solid and the seats are comfortable even on long highway runs. As much as I like the looks, after driving it a while I really have to question the design concept that the Magnum offers. It is a station wagon built to transport a lot of people and a lot of stuff. But mating this with a powerful engine with the taught racing-like suspension is uncomfortable for both. It is like having a Corvette tow a small trailer, and you are in the trailer and the Corvette driver is 15 years-old, pushing the car to its limits. (Only an actual Corvette has a much more comfortable suspension than the Magnum). Even driving on smooth roads, the steering is very darty and difficult to control. And with a large car, all that weaving and road feedback is exaggerated for the passengers and everything you�ve stored in the back. I like having a navigation system, but figuring out how to use it with the steering wheel controls made me frequently refer to the user�s manual. In spite of the high horsepower and low-end torque I played with when starting from a full stop, the RT model I drove averaged 20 MPG on the highway. What I presume to be the target market for this car, those 18-22 year-old guys that I mentioned, will probably love this car. And as much as I love driving sports cars, the darty steering and sharp suspension make it too uncomfortable without any spectacular payoff. The 0-60 sprint is fun for a little while, but I�d pass on buying a Magnum as a daily driving vehicle.